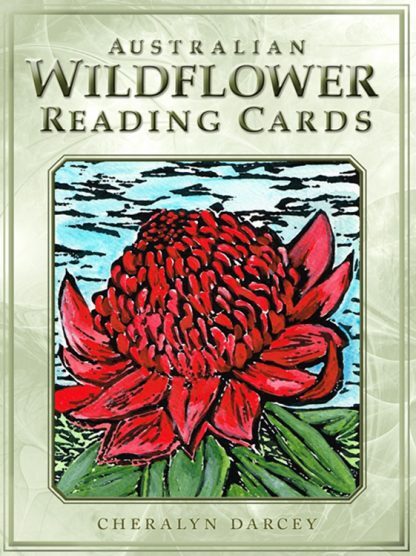 Australian Wildflower Reading Cards consist of 44 cards and a guidebook that provides guidance through native Australian Wildflower imagery and oracle teachings. The artwork is uniquely created by Cheralyn Darcey on linocut with traditional gouache paints. The guidebook features unique flower spreads for readings and a special card of the day instructions that will delight those that love beautiful oracle tools and traditional artwork. In every card, on every page, in every word, in every picture the Australian wildflowers will speak to you � soul to soul. This card set is alive and its messages are clear, healing, joyful and honest. Wherever you are in this world, the medicine of the Australian wildflowers, their messages and songs and profound healing powers are now in your hands. Cheralyn is an environmental artist, flower therapist and teacher who has had a lifelong connection with the spiritual and healing properties of plants. Her art has been featured in workshops, exhibitions, art prizes, and publications internationally for the past 30 years. Cheralyn was a selected environmental artist in residence at the International Environment Convention in 2011, has presented at the Australian Museum, and was an artist in residence during the Year of Biodiversity. She is the author of the Australian Wildflower Reading Cards, Flower Reading Cards, Florasphere Inspired, Florasphere Calm, Flowers of the Night Oracle, The Book of Flower Spells, The Book of Herb Spells, and Flowerpaedia.